Skutnabb-Kangas, Tove (2000). 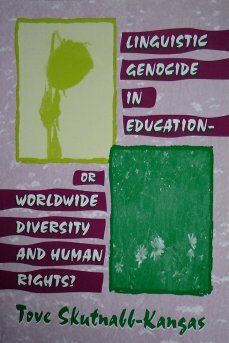 Linguistic genocide in education - or worldwide diversity and human rights? Mahwah, NJ & London, UK: Lawrence Erlbaum Associates, xxxiii+785 pp. ISBN 0-8058-3468-0. Mattusch, Max Hans-J　gen (1999): Vielsprachigkeit: Fluch oder Segen f　die Menschheit? Zur Fragen einer europ　schen und globalen Fremdsprachenpolitik. Frankfurt am Main: Peter Lang. Mufwene, Salikoko S. (1998): The Ecology of Language: New Imperatives in Linguistics Curricula. Paper presented at the Symposium on The Linguistic Sciences in a Changing Context, University of Illinois, Urbana-Champaign, 30-31 October 1998.